Police arrested two suspects in the shooting of a man on a Green Line train Tuesday afternoon. A 16-year-old boy allegedly shot a man in his upper back on a train stopped at the Anacostia station, Metro Transit Police said. The 16-year-old and 19-year-old Andre Broadie of northeast D.C. are in custody and are expected to be charged with assault with intent to kill. Police are requesting the 16-year-old be tried as an adult. Arraignment is expected Wednesday morning. Police are no longer seeking any other persons of interest and say the two in custody were the only two involved. There is no connection to terrorism, Metro Transit Police said, but the motive is unknown. Police identified the suspects from surveillance video in the station, News4's Mark Segraves reported. "Metro Transit Police in their security operations center were able to bring up cameras and see suspects leaving the train," Metro spokesman Dan Stessel said. "They were able to get a clothing description on those suspects." 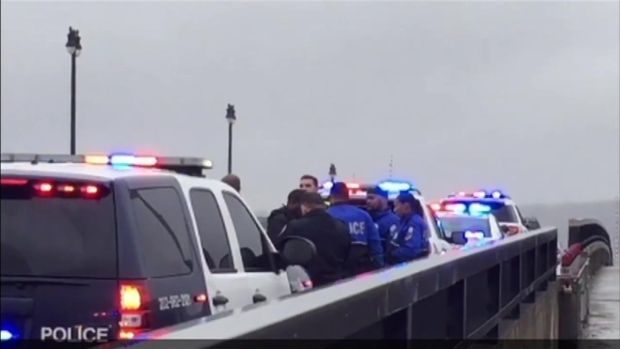 D.C. police saw them walking on the South Capitol Street Bridge. Growing concerns about safety on Metro following a shooting on a train. It's the latest in a series of violent attacks in the transit system. Transportation Reporter Adam Tuss reports. "Being able to share that video real-time, that snapshot of those two suspects was very helpful today, obviously," Metro Transit Police Chief Ron Pavlik said. A witness was taken to the bridge to identify the suspects, according to transportation reporter Adam Tuss. The suspects were taken away, and traffic resumed on the bridge.
.@wmata police identified suspects from surveillance video in station. Suspects in @wmata shooting were spotted by @DCPoliceDept walking across South Capitol Street Bridge. 2 suspects in custody have been identified by witness in @wmata shooting. 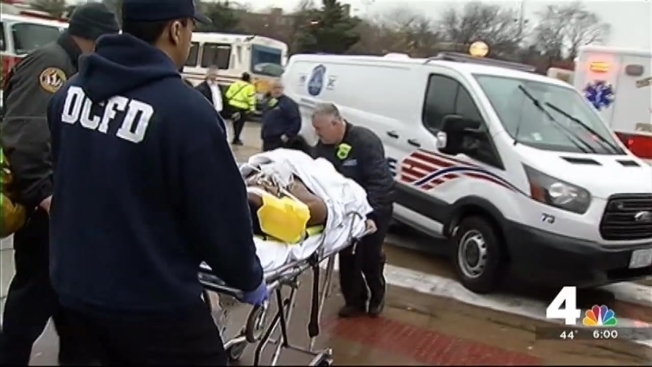 Victim shot on train while train stopped at Anacostia station. The 24-year-old victim was conscious and breathing when he was taken to a hospital, Metro said. He had been released as of 9:30 p.m.
"There were no injuries to anyone else other than the one victim," Stessel said. Metro officials said they don't remember a previous shooting on a train. Pavlik told News4 Metro Transit Police uniforms will be changing soon so officers will be more visible, hopefully deterring criminals. Police will focus on trains more as crime patterns have shifted to them. "We have tremendous confidence in Metro Transit Police," D.C. Deputy Mayor for Public Safety Kevin Donahue said. "I think what you saw today is the sort of thing the city will be doing more of, which is working closely together with Metro police, doing it in real time." The Anacostia station was closed for a short time, and shuttle bus service around the station was established until single-tracking was put in place. Normal service has resumed.